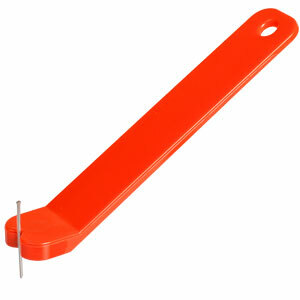 If you are prone to self-inflicted hammer pain, this little tool will be a great help. It holds nails in place with magnetism so you don't have to use your fingers. It's also handy when the nail position is not convenient for holding by hand. A great tool for every tool box. This convenient Magnetic Parts Tray holds metal nuts, bolts, screws, washers, clamps and other small ferrous metal objects. It has a strong magnet built right into the base with a rubber coating to prevent marring. It will attach to virtually any machine in the shop to keep all your parts in hands reach with out the mess. 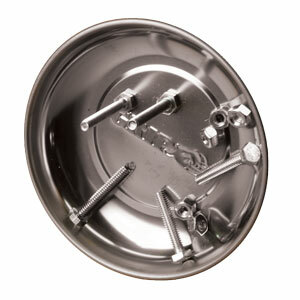 The tray is polished stainless steel construction. If you are tired of climbing up and down your ladder to retrieve the correct bit or to pick up the screws you dropped, this is your solution! 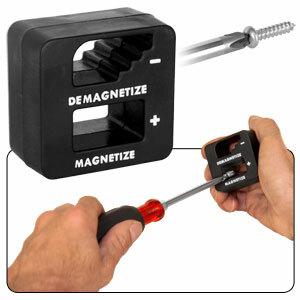 The Pro Hold magnetic band can be used strapped on your wrist, drill/driver or other hand tools. A great accessory for holding screws, drill bits, or driver tips close at hand. Fitted with nine high performance magnets, there is plenty of surface area for holding everything you need, right where you can see it. Comfortable wrist band with heavy duty Velcro strap. Stop blindly digging into a pouch, and just grab what you need!